The legendary metal band dropped their first record in eight years, 'Hardwired... to Self-Destruct', last week (November 18) and frontman James Hetfield, 53, says they plan on hitting the road for as long as possible in support of the album. James said: "We've booked out two years. So I can't predict the future, but we start there and hopefully there's more than that." 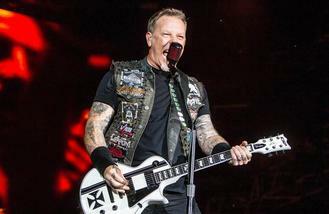 And fans may not have to wait as long for a new LP from the 'Enter Sandman' hitmakers, as James said he is already dying to get into the studio again and doesn't want to wait as long to put out new songs. He told told Linea Rock: "I would like to make some new music sooner thank eight years, for sure. "There's such a pleasure and a joy of hearing your new music and having other people hear it. So I don't wanna wait that long." It's taken the band - also comprised of Lars Ulrich, Kirk Hammett and Robert Trujillo - eight years to pen this release and, although James and Lars are the founding members of the group, bassist Robert, 52, was also allowed to give his two cents this time round. Robert recently said: "At the end of the day, it's their baby but I was there for the conception." Asked why it's taken them so long to drop a new LP, James - whose band has toured every year since 2011 - joked: "We had a lot of laundry to do after our last tour." Asked who their biggest fans are, James said: "We are our biggest fans, and Lars is the biggest fan of all of us. His entire house is full with Metallica merchandise."